I remember a few mailbags ago somebody mentioned that two plumbers in "The Plumbers Academy" episode of the Super Mario Bros. Super Show strangely resembled Wario and Waluigi. I watched my old video and took these snapshots to examine the characters. 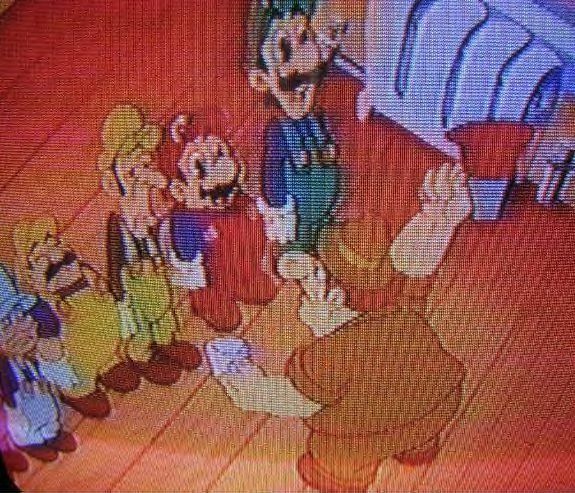 Take a close look at the two plumbers to Mario's right. Although they lack a few details, I agree that they heavily resemble Wario and Waluigi. Of course, this is pure coincidence, since Wario and Waluigi weren't even designed at that time, but I think it would be an interesting idea if Wario and Waluigi went to the same plumbing school as Mario and Luigi. I was thinking that those two could be Wario and Waluigi's "regular personas" before they became sworn rivals. They could have changed their clothes and faces later to contrast the Mario bros. What do you think? Are they Wario and Waluigi? MEGAß¥TE: It is an uncanny coincidence, but I do not think that they are Wario and Waluigi. 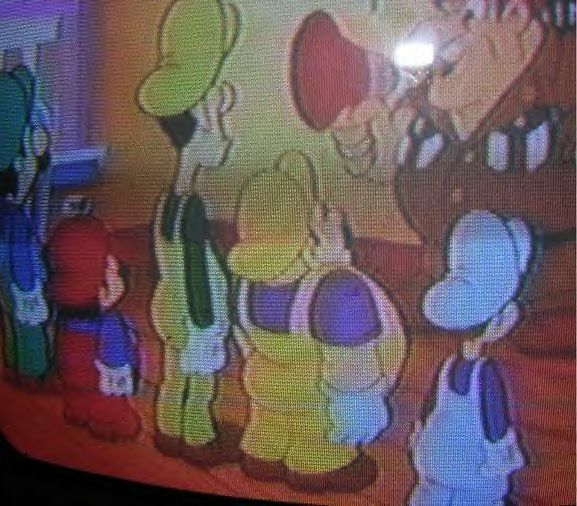 I remember watching that episode a long time ago and thinking that the yellow plumber was like a disturbing version of Mario. Hi. This is my first post so forgive me for any mistakes. 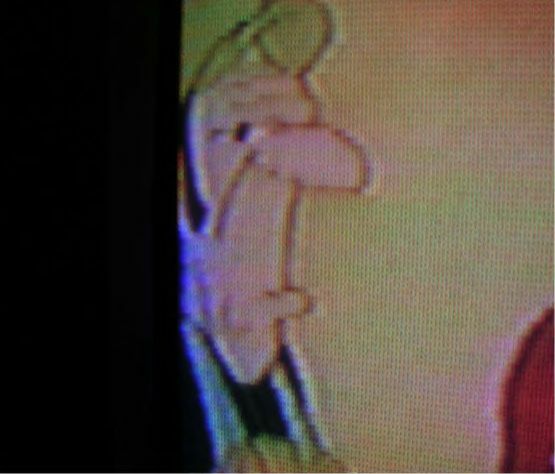 Anyway, I was just wondering why that in the Mario cartoons and movie that Mario and Luigi don't have Italian accents. Thanks. 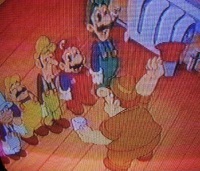 MEGAß¥TE: Back then, at least, Mario and Luigi were from Brooklyn so they were given Brooklyn accents. Do you think Super Mario Bros. DS will be released on September 13 for the 20th anniversary of the original? MEGAß¥TE: That's an interesting thought. Personally, if it takes them longer than that to perfect the game, then I'd rather they miss that date. Am I the only one who is worried about the future of Mario games? It seems to me that Nintendo is trying to much to cash into his franchise--he's in racing games, tennis games, a baseball game, golf games, RPGs, platformers, fighting games, and now he's making an appearance in a basketball game. Sure, all of his games are pretty high quality, but that may change. Actually, MK:DD and MPT do seem a little rushed. I'm worried that the amount of games Mario is in will go drastically up and the quality drastically down. And what about Peach? What the heck is happening to her? They're turning her into some sort of teenage-star. What's with the mini-skirt? It makes her seem a lot younger then she seemed to be in previous games, and quite a bit, shall I say, less intelligent? Come on Nintendo--you don't need to appeal to every teenage-guys hormones to sell games. But I guess games like Star Fox Adventures hasn't helped their opinion on that. But anyway, those are just some of my opinions. What about yours? MEGAß¥TE: I basically agree with everything that you said, except the Star Fox sentence, which I didn't understand. I just wish they'd kept the SSBM Peach. That was the best Peach render ever. Deezer: I also prefer the SSBM renders. Sapphira: As do I. But Peach wearing a shorter skirt DOES make more sense for the sports games. I mean, it's kind of hard to run in a long gown. However, I do agree that Mario games are starting to get more....questionable. I'm noticing Nintendo overall slowly getting more....debased. It truly saddens me. Chupperson: It's NOA more than anything else, I think. First I'd just like to say that I recently found your site and it has inspired me to dig out my old NES and play my SMB games. Which leads me to my question. The other days while playing SMB3 after I got through world 1-3 I noticed that my items bar was completely filled p-wing gems and I have no idea how I did that. Are any of you aware of a trick or glitch that could be used to repeat this event at a later time? MEGAß¥TE: This happens after you beat the game and reset. If you didn't do this, then it is possible that the memory location that activates that bonus somehow got set when you turned the machine on... I seem to recall that as a possibility, and occurances like that are more likely as the hardware gets older. Sapphira: I've said this before, but please do not deify me. Thanks. Hi, this question probably won't be posted but I am dying to know what you guys think of the possibilities of the Super NES classic Super Mario RPG will be ported over to either Nintendo DS (It makes more sense as it has four action buttons) or Game Boy Advance. I know the game was developed with Square but now Square is making games with Nintendo as it recently ported Final Fantasy I and II and working on III for DS so I am hoping for Mario RPG port. Please let me know if possible what you guys think the possibility would be and on which handheld it most likely would be ported to. MEGAß¥TE: It's certainly more possible than the last 10 times people have asked us that in the mailbag. Chupperson: I'd hate to see how they're mutilate it for GBA. I say keep it on SNES and give us more original GBA RPGs. Or better yet, DS RPGs. What kind of last name is Wazelewski? Not to be mean or anything but I just want to know. Is it like Polish or German? Deezer: Misspelled. To answer your other question, it's Polish but I'm mostly German. Hey, it's zanna728 (again.) I know this is like my second email in a row, but it couldn't wait. You know, so many people use this mailbag to complain about stuff in games. They sound so whiny. ( I expect to get a lot of sarcastic "Nooooo! "s) But, anyway, if you showed some of the complaints to Nintendo, they might take us complainy people's complaints seriously, and improve the games. Like, everyone is like: "Wario should be in SSBM's sequel!" But if you told Nintendo that the public want Wario in SSB-related games, they might squeeze him in there! You could actually make games not so hideous! If you guys do that, I deserve a big thank-you. One in advance would be nice. 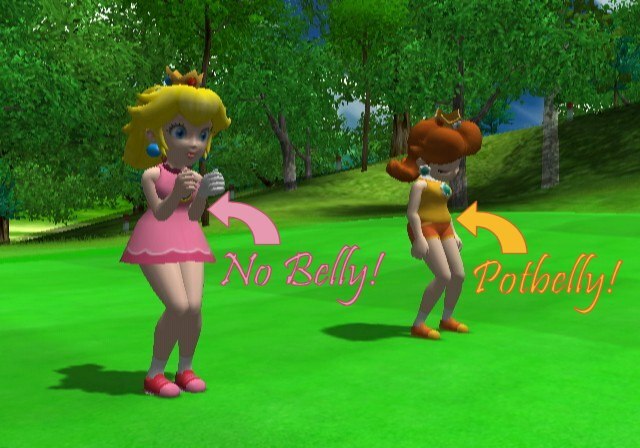 Oh yeah, Peach and Daisy are ugly. Peach has wrinkles, and Daisy looks like a mouse. And what's with their dresses? Hello, it's called jeans! They should make a new female Mario character, maybe she could have her own adventure.... Oh, got it! She should be Peach's little sister, and she could have gotten all of the good Toadstool genes, and could help Mario on his adventures, and play golf and tennis.... Probrably not drive, because Peach is supposed to be young, and if she's younger......... HEY, HOW OLD ARE ALL OF THESE CHARACTERS? I ASKED THAT A LONG TIME AGO, BUT YOU NEVER ANSWERED! ARE YOU AFRAID OF A CHALLENGE? (Oh, yeah, could I draw her for fanart? Sounds fun.) I know you don't care, but if you follow my advice about my first idea, maybe Nintendo will care. Oh well, buh-bye! Deezer: I'm still trying to find Peach's stomach. MEGAß¥TE: Nintendo has never given an age to the Mario characters. If you were to calculate their ages based on the ages at the time of the actors who played them in the Mario movie, they'd be as follows: Mario = 50, Luigi = 28, Koopa = 57, Daisy = 23, Toad = 35. J.J. mentioned 4 years ago that Mario's age was pinned at 35 in the cartoons for whatever that's worth. Miyamoto described him as middle-aged, which would be between 45 and 65. Sapphira: Umm... Where does Peach have wrinkles? Also, they're princesses; that's why they wear dresses. Besides, citizens in the Mushroom World have different clothing styles than we do. Your site PWNS. Anyway, You claimed that the Coin Trophy entry in SSBM contained an error. The trophy stated that its unclear to wether Coins were the official currency of the Mushroom Kingdom. While in Super Mario RPG and Paper Mario, coins were used as currency, this does not by any means mean its the actual official currency. Take the United States for example, everyone knows all legal tender US money is produced by the Federal Reserve and is United States Notes and United States Coin. While this is the official legal tender currency, this doesn't mean that its the only currency used. Many currencies are used in the US that are not legal tender, these range from the Ithica Hour used in Ithica New York, to the nationwide American Liberty Dollar (www.libertydollar.org , feel free to remove the link if you use this, I only put it there for your reference). These currencies are not legal tender, but they are lawful and have been reviewed by the US Treasury to be legitimate, though they aren't recognised (spelled wrong to annoy you) by the Federal Reserve. Canadian pennies are also used sometimes in the US even though they aren't the official currency. So, there is still a question of wether or not Coins are the official currency of the Mushroom Kingdom, coins may just be bullion rounds of precious metal used to barter with, especially since there is no monarch or country name on the coins. Deezer: That's all well and good, but Coins seem to be the only currency of the Mushroom Kingdom. Lizard Dude: I'm going to have to side with Gguru1, Deezer, because Luigi seemed quite interested in those bills in Luigi's Mansion. Deezer: Oh yeah, Luigi's Mansion had Coins and bills. Actually, he only seemed really excited when he sucked up one of those big gems. how come mario never ages? and why have most yoshies since Yoshi's Story been depicted as babies? maybe you have an answer..
MEGAß¥TE: He does. They haven't. Lizard Dude: Why doesn't Bart Simpson age? Some characters just don't get portrayed as older as our time marches on. But, he has aged from a baby in Yoshi's Island to a middle-aged plumber in the other games. This is my first time doing this,so,here's my question. Why have you not updated the DS,GCN,or GBA parts of the site? MEGAß¥TE: We were in the middle of converting our system pages to use a database for easier updating when Gamespy shut it down. Short letter this time (well, shorter than others from the past, anyway..). Do you happen to know of any games (Mario or otherwise) that have ever had a release date of 1-1-05 (or something like that)? MEGAß¥TE: Nothing of real interest. Why do you ask? Hi, i'll make this quick. If chup and sapph are sibling, why does chup have black hair and sapph have blond hair? I failed genetics. Deezer: Genetics has nothing to do with e-siblings. Sapphira: Besides, siblings can have different colored hair from each other, anyway. Oh, and Chup has brown hair, not black, despite his caricature. So I hear that Mario, Peach, and Luigi will be in NBA Street V3. I followed your link to their site and saw the movie. My only response was this: HUH?! O_o !!! What was that?! >:( I mean, HONESTLY! I mean, I can understand crossovers when they actually mean something, like Super Smash Bros. (they were all famous nintendo characters), but an EA sports game is just...blasphemous. I mean, I don't even like sports video games. I think video games should just deal with stuff that aren't possible in real life (e.g. saving princesses from fire-breathing snapping turtles). Mario in NBA Street is just weird. It's not even a bright funny game like Mario Tennis, but a gritty street court with real life NBA stars. Though I have to admit that it was funny seeing Mario next to actual NBA players, this game is a bit much. This is the kind of stuff that's usually left to parody Flash cartoons on Newgrounds. I mean seriously! MEGAß¥TE: I don't think the stuff they do in NBA Street is possible in real life, either. 1. Ever wonder what it would be like if Mario wasn't...well...Mario? He'd be like...Frank...Frank Joobie. Frank climbs poles. He also sleeps. Wow. 2. No offensive, but don't-a we all think that Waluigi should have not been made in da first place? He's simply weird...very. 5. DK's kinda a wimp. I mean, at the VERY END of Mario VS Donkey Kong, DK cries becasue he didn't get his toys! HE ************in' CRIES!!!! I thought he was tough. 6. How long has Mushroom Boy been with the TMK crew? 7. How long does Princess Toadstool stay on the screen for in World -1 in Famicon's SMB? Does she pop up periodically...or what? That's-a it...keep up the muchos awesome work! P.S. : Peach REALLY needs to consider a career change...I'm thinkin' mailroom clerk. 4. SMB5, yes; we'll have to see what comes of the DS SMB game. SMB4 was official (for the hundredth time). 6. Since March 2, 2001. 7. She doesn't move, so she stays there as long as you don't scroll her off of the screen. P.S. : We'll see what happens in Super Princess Peach. Deezer: 1. Yeah... he would be Jumpman. 2. I guess he comes in handy when you need another selectable character for a Mario Tennis/Golf/Party/Kart title. 4. (NEW) SMB for DS seems like a good candidate for "SMB5." Sapphira: 1. Or "The Great Gonzales." 2. I say if Ninty's gonna create a new Mario character for multiplayer games, they should at least put them in other Mario games, too. I now have much less of a beef with Toadette's existance since she's actually in PM2. Waluigi's been in so many Mario spin-off games that he needs to be seen in a regular Mario adventure game, too. 6. He kept eating all our mushrooms, saying they were "regular," and he wouldn't give us anything for them, so we kidnapped him from his shop in Seaside Town. Now we lock him up and Deezer feeds him bread. MEGAß¥TE: Except Yoshi's Island actually isn't SMW2 in Japan, and I would consider it the start of the Yoshi platforming series, not Mario. Well, it's not as bad as the DK sequel naming consistency, at least. (1) What did everyone get for Christmas? P.S. I HAVE found the secret page, thank you! Oh, and lists of questions is NOT what makes a letter a letter... at least not a good letter. Lizard Dude: (1) A DS with SM64DS, flannel pants, sweatshirt, chocolates, cow pi shirt, A Brave New World, The Man in the High Castle, 2005 weeds, water and invasive species The Montana Noxious Weed Calendar, and $50. Chupperson: (1) Half a Nintendo DS, music books from the Lord of the Rings movies, Glinda of Oz, flannel pants, a kazoo, Castlevania: Circle of the Moon, a lot of Star Trek "Fotonovels", a few other Star Trek books, and $75, with $30 of which I bought SM64DS.